Celebrated author and Holocaust survivor Wiesel laments that Jewish people have always been and continue to be ""vilified, threatened, offended, and physically marked for humiliation,"" and supporting evidence abounds in the photographs that accompany his and United Nations Secretary General Annan's remarks: a Denver, Colo., church sign proclaiming, ""Jews killed the lord Jesus"" and a flyer for a 2003 anti-Israel rally at Rutgers University reading ""at Rutgers, you can't kill Jews. but you can help people who do"" are startling reminders that anti-Jewish sentiment is regarded as a source of pride in some circles. 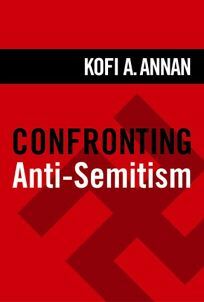 Even the United Nations cannot boast an unblemished record regarding Jews; Annan acknowledges, ""The General Assembly resolution of 1975, equating Zionism with racism, was an especially unfortunate decision"" and praises recent efforts of the U.N.'s Office of the High Commissioner for Human Rights to make anti-Semitism one of their chief concerns. Photographs of emaciated children at Auschwitz and a 15th-century woodcut depicting Jews murdering a Christian baby, though disturbing, are not surprising given their historical context, but images of swastikas spray-painted on graves in a Jewish cemetery in St. Petersburg, a Jewish school in Canada destroyed by an arsonist and ""contemporary Italian"" wine bottles with labels depicting Hitler and Mussolini are alarmingly recent-all are dated in 2004. The images collected make it plain that the anti-Semitic furor that has persisted throughout history still has a strong presence all over the world.